Long-term efficiency gains for the fleet on account of data capture and analysis on board and onshore. Declaration of intent signed at the SMM. Rickmers Shipmanagement and Interschalt signed a declaration of intent at the SMM for the installation of Bluetracker. This software will enable Rickmers to digitally monitor its fleet in real time anywhere in the world. As such, the shipping company will be able to access an extensive amount of data which, when analyzed, will identify measures to realize cost savings. The aim is to equip the entire fleet of around 100 vessels with the state-of-the-art software. Full installation across all vessels should be completed within the next two years. The contractual partners have already proven the successful cooperation. Rickmers already uses Interschalt 's MACS3 loading computer and began trialing Bluetracker on some of its vessels at the beginning of the year. After an initial test phase lasting approximately six months, the entire fleet is now set to follow suit. "Bluetracker has impressed us across the board. The flexible system provides us with the required data and will help us to increase the efficiency of our fleet in the long term. We will be able to reduce our fuel consumption and hence emissions, which will also bolster our commitment to environmentally friendly shipping", says Dr. Eng. Georg Eljardt, Director of Maritime Technology at Rickmers Shipmanagement. Robert Gärtner, CEO of Interschalt adds: "Bluetracker allows you both to control costs and increase efficiency on board and onshore. With the aid of the Energy Efficiency Monitor installed on board, the crew is able to take proactive measures to help achieve the shipping company's efficiency targets. The shipping company is able to access the data anywhere in the world via a web browser which means that it can develop sustainable strategies for optimizing costs and capacity utilization", says Robert Gärtner on the vessel monitoring system. To date, Rickmers has been using a manual reporting system which Interschalt will use as a basis to build upon. Bluetracker will assess and analyze this manually captured data. The next step involves installing an automated data capture system. The fact that the data is recorded with such precision means that the shipping company will be able to analyze consumption and trim and compare several vessels and routes simultaneously. 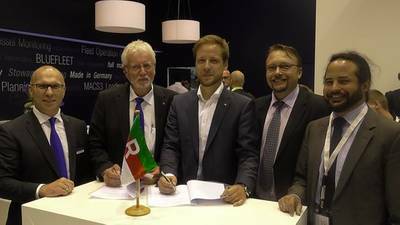 The conclusion of this contract was one of the highlights for Interschalt at this year's successful SMM. The software experts showcased their range of products and services to industry professionals over four days. As part of its focused commitment to innovative software solutions for the shipping industry, Interschalt had a brand new stand at the trade fair this year. It was designed and equipped to showcase the software products in a modern and vivid setting. Visitors were immersed in a bright maritime environment spanning over 100 m2. Using various workstations, Interschalt employees were able to demonstrate the functions and operating modes of individual software solutions in one-on-one conversations with visitors. In addition, informative presentations on the products were screened several times a day. "We are thrilled with how we did at this year's trade fair. The whole team made hundreds of new contacts and had very promising conversations which we are sure will lead to new business. Overall, despite the ongoing shipping crisis, there was a very positive and motivational atmosphere. We are optimistic in every respect - both for the industry as a whole and our future business", says Robert Gärtner.